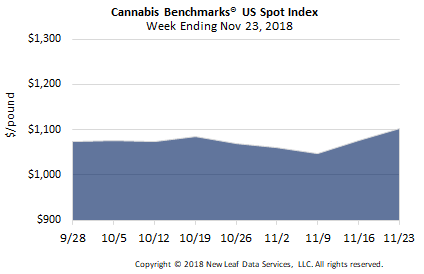 U.S. Cannabis Spot Index up 2.5% to $1,103 per pound. The simple average (non-volume weighted) price decreased by $6 to $1,256 per pound, with 68% of transactions (one standard deviation) in the $489 to $2,024 per pound range. The average deal size increased 4.2% to 4.4 pounds from 4.2 pounds last week. In grams, the Spot price was $2.43, and the simple average price was $2.77. The stability that has recently characterized national Transaction Stats was again on display this week. The relative frequency of trades for greenhouse flower contracted marginally, by less than 1%, with any corresponding increases so small as to not be visible in the chart below. 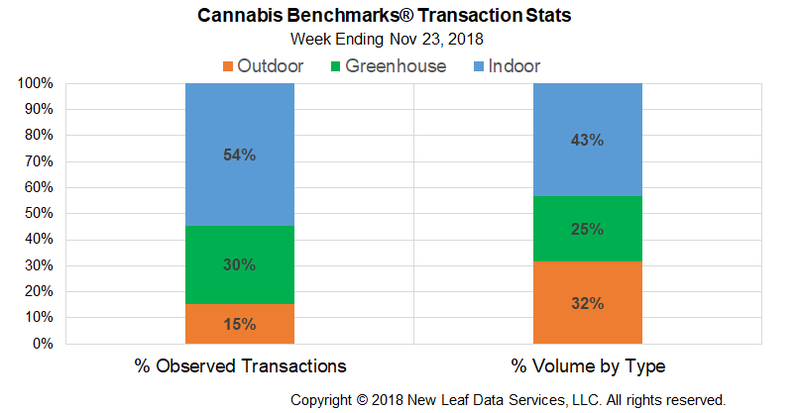 Indoor-grown product’s share of the total reported weight moved nationwide in state-legal markets expanded by 1% compared to last week; the relative volume of outdoor flower decreased by the same proportion, while that for greenhouse product was unchanged. The U.S. Spot Index followed last week’s 2.7% rise with an increase of 2.5% this week, causing it to settle at $1,103 per pound. This week’s national composite price is the highest observed since September 7th, prior to the commencement of the harvest season. A notable uptick in California’s Spot rate was primarily responsible for the continued climb of the national average this week, while an increase in Colorado’s composite price also applied upward pressure. 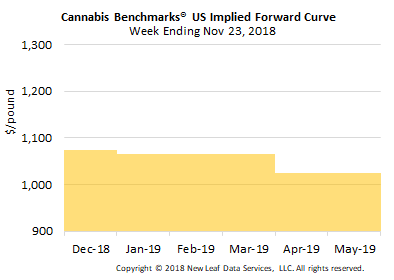 Rising prices in the two largest state-legal cannabis markets overwhelmed continued downturns in Washington State, where historically low wholesale rates continue to be reported, as well as modest declines in the Spot Indices of Oregon and Nevada. Last year at this time, the U.S. Spot Index experienced a rise of 1.8% in the week of the Thanksgiving holiday. 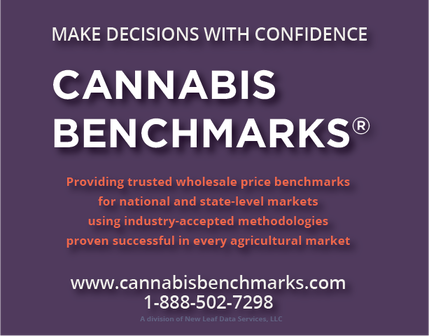 The national volume-weighted price for flower to be sold in adult-use markets climbed again this week, as upticks in California and Colorado outweighed declines in Washington and Alaska, as well as marginal downturns observed in Oregon and Nevada. 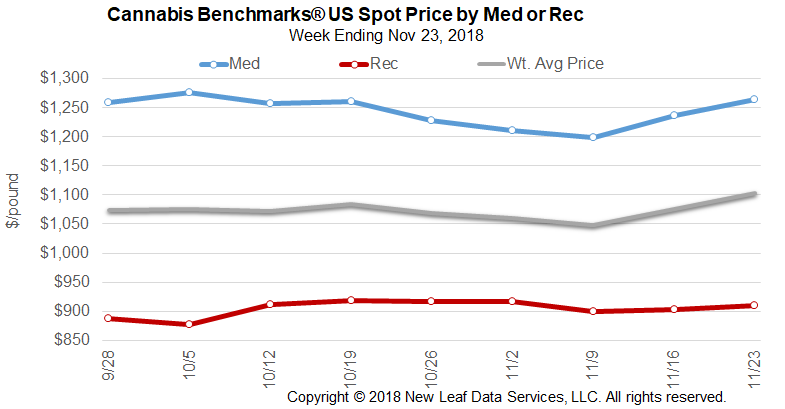 A rise in rates for flower designated for patients in California, along with an increase in Arizona’s Spot Index, were the primary drivers of the increase in the national volume-weighted price for product in medical markets. December 2018 Forward up $25 to $1,075 per pound. The average reported forward deal increased 1 pound to 57 pounds. The proportion of forward deals for outdoor, greenhouse, and indoor-grown flower was 55%, 30%, and 15% of forward arrangements, respectively. The average forward deal size for monthly delivery for outdoor, greenhouse, and indoor-grown flower was 68 pounds, 44 pounds, and 41 pounds, respectively. At $1,075 per pound, the December Forward represents a discount of 2.6% relative to the current U.S. Spot Price of $1,103 per pound. The premium or discount for each Forward price, relative to the U.S. Spot Index, is illustrated in the table below. Watch our CEO, Jonathan Rubin, in his latest appearance on BNN Bloomberg discussing the price declines experienced in competitive U.S. markets and the likely parallels forthcoming in Canada.